at the Rios Tropicales Operations Center near Siquirres. Today brings the final installment of what I expected to be a short series of trip reports. But with so many amazing experiences to chronicle, I couldn't condense it down into any less than four pieces. Thanks to those of you who've stuck with me through the entire journey, and you can always catch up by reading Part I, Part II, and Part III. We woke at the Radisson San Jose the morning of June 20th and loaded everything except what we'd need for a jungle adventure into a master room for safe keeping. 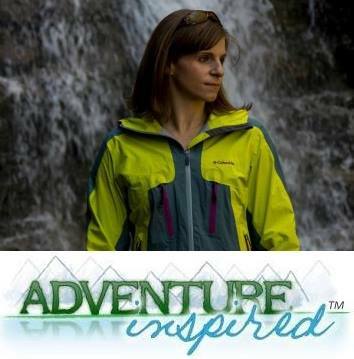 I packed my favorites, the Women's PFG Zero Short Sleeve Shirt, PFG Zero Tank Top, PFG Coral Point II Shorts, Sunbreeze Vent Flip, and of course, my OutDry Extreme jacket, among other things. It was cloudy, rainy, and relatively chilly that day, and after hopping a bus, we took off east toward the Caribbean side of Costa Rica. 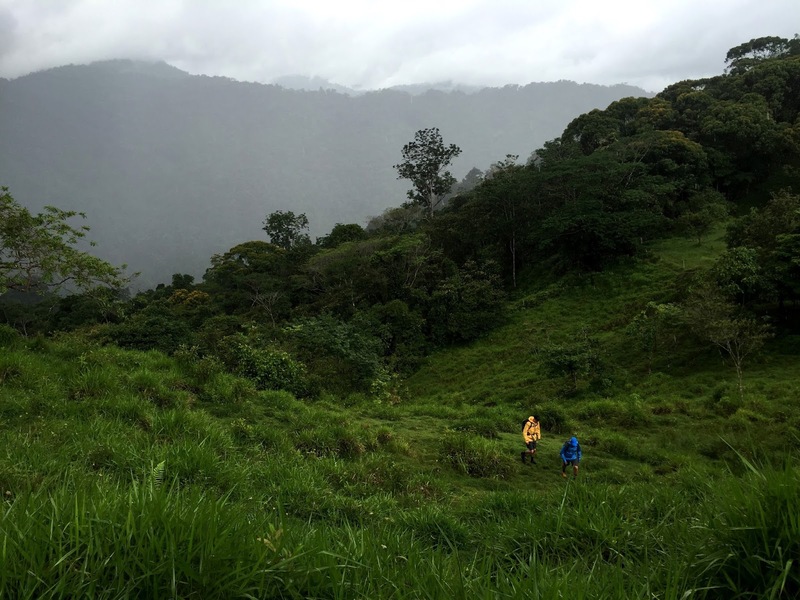 Once we were out of San Jose, we started climbing up through the rainforest. The highway, though in great shape, was twisting, winding, and according to our guide, regularly subject to mud slides. We made it to the Rios Tropicales Operations Center without incident, unpacked, ate lunch, and explored. Our luggage was condensed down further to what we’d need for a few hours on horseback while the rest was packed in dry bags and handed over to be loaded on rafts. Eventually, we’d be reunited with our luggage at the Pacuare Ecolodge, deep in the rainforest. Pausing at the top of a hill during our ride. The clouds, fog, and rain made it feel other-wordly. 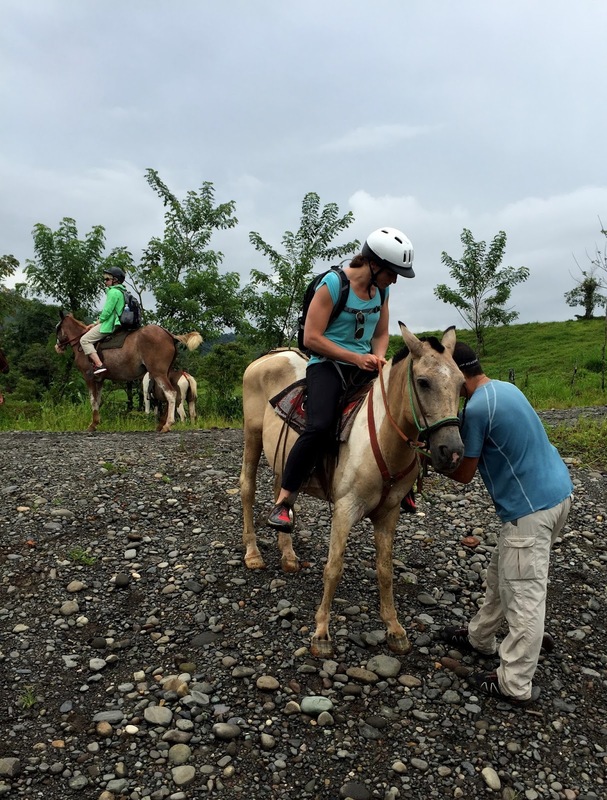 After jumping back on the bus and driving along paved roads, we turned down a steep gravel road, the kind of road I'd learned to accept as normal in Costa Rica. The terrain we traversed was absolutely beautiful. We pulled over at an intersection I wouldn't have recognized as anything significant and parked next to a long row of horses tied to a fence. They'd be our ride to a trailhead that would lead us to the lodge, our home for the night. The last time I'd ridden a horse was at a friend's birthday party in kindergarten, so, naturally, I was a bit nervous. My concerns were, in my opinion, absolutely 100% valid. Is the horse going to throw me into a ditch? What if I want to stop and the horse doesn't? Will the horse decide he's bored and just start running? But my horse, Comanche, was patient and agreeable, and an hour later, we stopped for lunch at a beautiful hideaway along the road. While we ate, we learned about the history of Rios Tropicales, which directly translates to "tropical rivers." 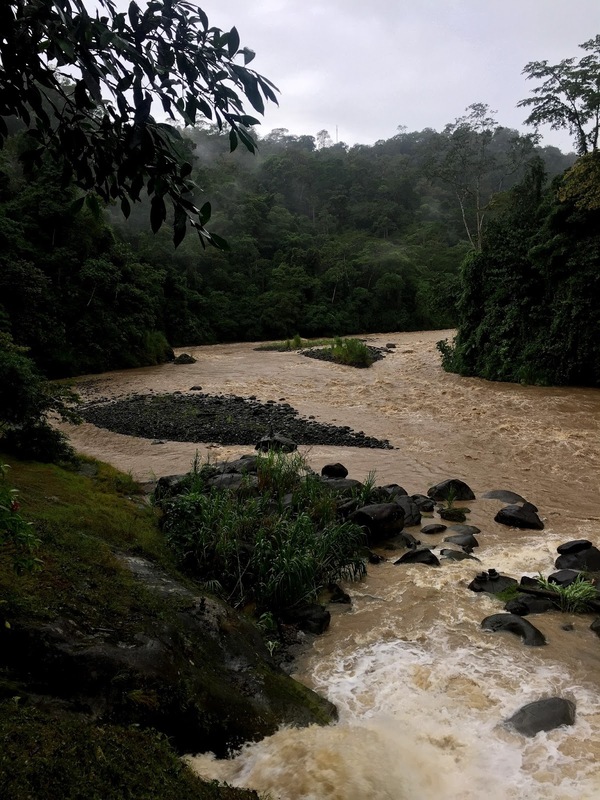 Rios Tropicales was founded in 1985 with the goal of sharing Costa Rica's incredible rivers with anyone interested in exploring them, and doing so in a sustainable manner. The company hires locally, established a non-profit environmental organization to protect the rivers, engages in rainforest land protection efforts, develops education programs for local communities, and has won numerous awards. It was especially meaningful to hear from one of the younger staff members responsible for a butterfly garden on site at our lunch spot, home to dozens of beautiful blue morpho butterflies. 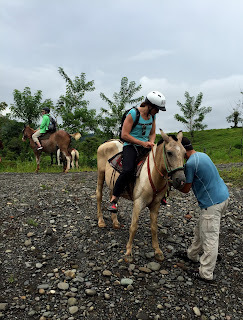 We hopped back on the horses and rode for another hour, stopping at the top of a hill just as it started to rain. While the horses were being taken care of, I chatted with one of our guides, Randall, about what was to come. 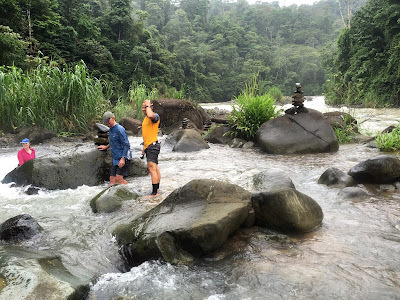 We'd hike down hundreds of steps from the top of the hill into the Pacuare River gorge, steps too steep for the horses to navigate, cross a wobbly suspension bridge over the Pacuare River, and spend the rest of the evening exploring the rainforest before whitewater rafting out the next day. Or so we thought. Skier Dylan Ferguson and #Omniten Weston Shirey in the Outdry Extreme Jackets. As soon as we'd finished taking photos at the top of the hill with the Columbia media team, the skies opened up and it started pouring. If I learned anything about playing outside in Costa Rica during the rainy season, it's that you've got to be amenable to being wet. You're either sweating from the heat and humidity, or soaked to the bone from frequent downpours. The hike into the gorge was muddy, but wonderful, and I could hear the Pacuare River long before I could see it. The Pacuare's three commonly run sections are popular among whitewater sports enthusiasts, and as soon as the river came into view I could see why. 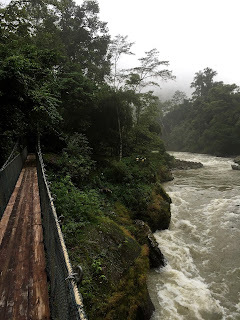 The river was flowing quickly underneath us as we crossed a skinny, slippery suspension bridge over the gorge, and it seemed to rise by the minute as the rain fell. 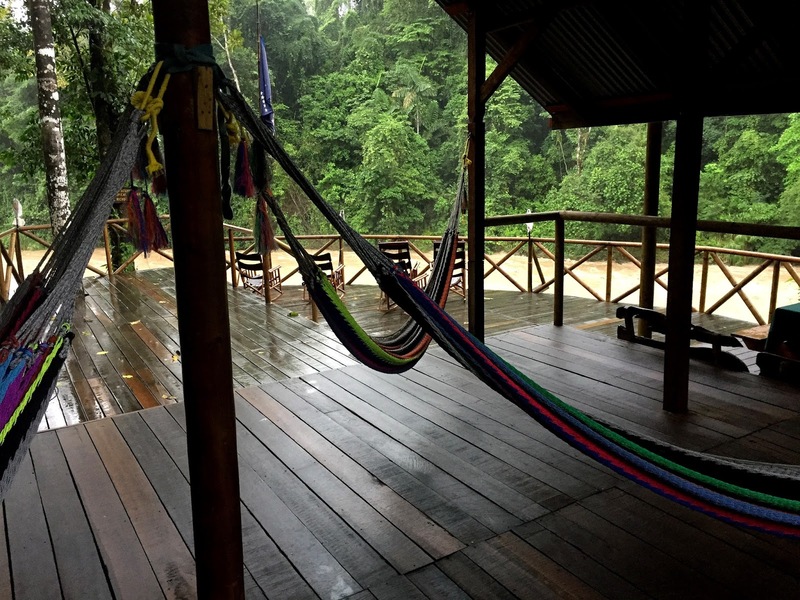 The Pacuare Ecolodge is exactly what I'd imagined when I pictured a Costa Rican jungle escape. It feels cliché to describe it as magical, but as we traversed the riverbed and small wooden buildings nestled in between towering rainforest trees came into view, that's exactly how it felt. This beautiful deck with hammocks sits right next to the dining pavilion and kitchen. It was so relaxing spending time here. The Rios Tropicales reserve is home to structures built from reclaimed wood and the entire campus is powered by water. I had trouble wrapping my head around the fact that everything the crew couldn't harvest from the forest to outfit and maintain the reserve, including our food and supplies, had to be sent in by boat. The single floor lodge building I stayed in with fellow #Omniten Katie Boue housed four separate rooms, and ours had two of the most comfortable beds I'd slept in on the entire trip. The swinging suspension bridge over the Pacuare. The covered open air pavilion we'd have cocktail hour and dinner in gave us incredible views of the river, and its central location made it a perfect gathering place. 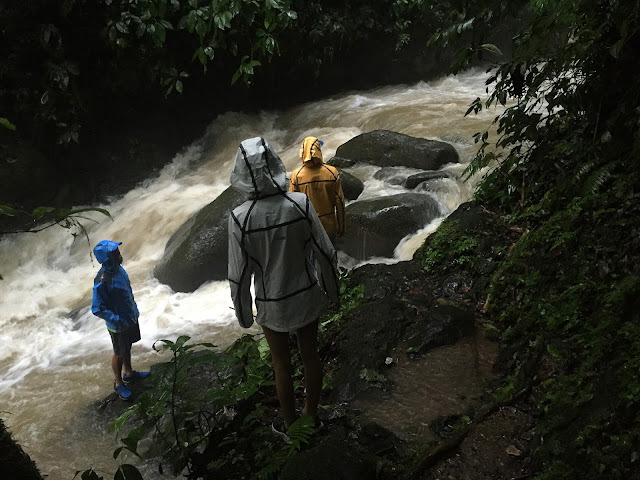 We spent what was left of the afternoon and evening swimming in waterfalls along the edge of the gorge, running around the reserve's trails, and ignoring what had turned into a warm torrential downpour. Cocktail hour brought mojitos made with fresh mint and rum I was trying to picture floating down the Pacuare on a raft. We watched the river continue to rise, shouting conversation over the rain and the roar of the water. Somehow, despite how powerful the water was, and how hard the rain was falling, it was soothing. 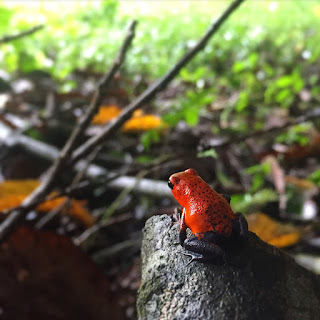 I didn't expect anything out of the ordinary for dinner, given we were in the middle of the rainforest, but it was one of the best meals I had in Costa Rica. Served by candlelight as the sun set, we chowed down on fresh fish, rice, vegetables, and flan for dessert. swam in the day before, was definitely not swimmable! The torrential rain continued through dinner, dessert, and into the night. Our guides warned us that if the river was too high, we'd have to forgo whitewater rafting and climb back up out of the gorge instead. I fell asleep to the hum of cicadas, which we could barely hear over the rain. At one point, I remember waking from a dream that the entire reserve had flooded. When I crawled out of bed the next morning, we couldn't flush the toilets or run water in the sink due to the heavy rain causing problems with the septic system, but it didn't matter. We had an incredible breakfast of fresh fruit, pancakes, eggs, and plenty of coffee while we waited to hear whether we'd be rafting or hiking out of the lodge. One of our guides pointed out a giant rock in the middle of the river with colored lines (red, white, green) painted on it, which served as their flow meter. If the water level stayed above the red lines, we'd have to hike out. When he showed me the rock, the water was lapping at the red lines, and it was still raining, but he said it was common for the water to drop a foot in an hour. While we waited to see if the river was runnable, Katie, Weston, Dylan and I put on our OutDry Extreme jackets and went exploring. The waterfalls we swam in the day before were dangerously high; it was incredible to see how much more powerful the flow of water became overnight. Word traveled quickly among the group that our flow meter rock was completely underwater after another hour of sustained rain, and that we'd be hiking out, much to the chagrin of some members of the group. But I couldn’t wait. Wandering around the reserve in our Outdry Extreme jackets, which we definitely needed. It's was pouring! This "stream" sits right next to the building Katie, Wes, Dylan and I slept in. Whitewater rafting would've been a phenomenal way to see the rainforest from a different perspective, but our unplanned climb out of the gorge would be our first and only real hike of the trip. The climb went quickly, and before long, we found ourselves back up at the top of the hill walking along the road we'd ridden horses on the previous day. It felt amazing to walk for a while despite the fact that I was completely soaked. Jose, where we spent our last night in Costa Rica. We had one last group meal and I tried to avoid going to sleep as long as I could. Swimming in the Pacuare right after we arrived at the ecolodge. The toughest part about trips like this one isn’t always saying goodbye to the amazing places I’m lucky enough to visit; it’s saying goodbye to the people. Between the Columbia media team responsible for telling our stories through photo and video, the other journalists and photographers from around the world who joined in the adventures, the staff members at all of our overnight destinations, and our guides, I found myself frantically trying to find ways to keep in touch with all of them. I arrived in Philadelphia late on June 22nd after eight days away sporting luggage that smelled like a mixture of coffee and wet dog. Though I was excited to see my friends and talk to my family, I’m secretly happy that no matter what I do, none of the shoes I took to Costa Rica will ever be clean again. Words can’t express my gratitude to Columbia Sportswear for sending me to Costa Rica. Look for more photos, videos, and documentation of #OmniTen stories on Columbia.com. If you’re planning a visit to Costa Rica, or if you’ve been to any of the places mentioned in my trip reports, I’d love to hear about it! Two things stand out here and sound great right now: horseback riding and those hammocks. I know I've said this before, but THANK you for sharing these posts. You thank us for sticking all the way through, but you make it a pleasure to read. :) Costa Rica has always been on my bucket list. I think it's time to make it happen soon!